NATIONWIDE — The optimism concerning medical office buildings (MOBs) as a real estate product type continues to grow, with a certain number of reasons for such optimism being cited time and time again. Among them are the country’s aging demographics, continued increases in healthcare spending, strong and growing demand from various investor types, the ongoing shift from an inpatient delivery model to an outpatient one, and so on. A new report issued by Calabasas, Calif.-based Marcus & Millichap Inc. (NYSE: MMI), confirms those reasons while pointing out quite a few other facts and statistics about the product type. 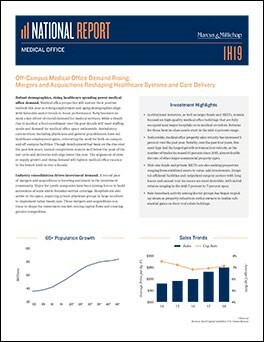 For example, Marcus & Millichap’s National Report on Medical Office Buildings for the first half of 2019 indicates that one of the reasons why MOBs will remain a solid investment and perhaps an expanding product type is that enrollments in the country’s medical schools have been on the rise during the past decade or more. For several years, healthcare real estate (HRE) professionals were concerned that even if demand for outpatient services continued to rise along with investor demand for MOBs, that demand would be offset by a pending shortage of doctors to fill the facilities. But statistics from the Association of American Medical Colleges (AAMC) confirm what Marcus & Millichap reports, noting that first-year enrollment at U.S. medical schools increased by 28 percent between 2002-07. Enrollment in the country’s medical schools reached 21,030 in 2016-17. This increase in medical school students will help alleviate, but not solve, a projected shortage of 105,000 physicians by 2030, according to the AAMC. In addition, consolidation in the healthcare sector continues to drive the strong demand for healthcare facilities. That demand is so strong, Marcus & Millichap reports, that institutional investors, as well as larger funds and real estate investment trusts (REITs) focused on acquiring high-quality, stabilized MOBs near major hospitals have driven capitalization (cap) rates, or first-year estimated returns, to the mid-4 percent range. ■ A robust pace of lease signings combined with tight existing operating conditions led to a 3.2 percent increase in the average MOB rental rate nationwide in 2018, with the average rate reaching $23.51 per square foot to end the year. The areas experiencing the biggest average rent increases were the Central Plains states, where the average rate increased 5.7 percent to $20.07 PSF, and the Northeast, where a 5.4 percent increase brought the average rental rate to $24.59 PSF, according to the report. ■ Construction of new MOBs topped 12 million square feet in 2018, the highest total since 2009. Off-campus MOBs continue to dominate new construction trends, according to the report. Underserved communities in Texas and California accounted for the bulk of the new supply in 2018, with the migration of baby boomers to the Sunbelt states accounting for much of the new construction. ■ The nationwide MOB vacancy rate rose by 10 basis points in 2018, to 8.2 percent. The drop in new MOBs deliveries, as noted above, will result in a reduction of the national vacancy rate to 8 percent in 2019. Regionally, the Central Plains remains the tightest MOB market, with a vacancy rate of 5.3 percent. In several Midwestern cities, such as Milwaukee, Charlotte, St. Louis and Cincinnati, where new MOBs are scarce, the vacancy rate has dropped to less than 5 percent. ■ The Southwest region has the highest MOB vacancy rate at 11.1 percent. The Marcus & Millichap report was issued by Alan L. Pontius, senior VP and national director of specialty divisions; and John Chang, senior VP and national director of research services. For a complete copy, please visit click here.